DOK1 from other species may also be detectable. Sample Data :Representative western blot with Anti-DOK1 (1:1000) using 3 μg, 10 μg and 30 μg of 3T6 cell lysate. Scientific Background :DOK1 contains pleckstrin homology domain and ten PXXP SH3 recognition motifs and is a critical substrate for p210 bcr/abl. DOK1 is constitutively tyrosine phosphorylated in hematopoietic progenitors cells isolated from CML patients (1). 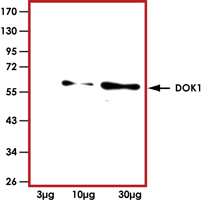 DOK1 is associated with p120 Ras-GAP and this association is correlated with its tyrosine phosphorylation. Aberrant phosphorylation of DOK1 may contribute to the progression of different human diseases (2). 1. Carpino, N. et.al: p62(dok): a constitutively tyrosine-phosphorylated, GAP-associated protein in chronic myelogenous leukemia progenitor cells. Cell 88: 197-204, 1997. 2. Yasuda. et.al: Role of Dok-1 and Dok-2 in myeloid homeostasis and suppression of leukemia. J. Exp. Med. 200: 1681-1687, 2004.